Example A illustrates the failure of the pointing element of the construction. Water ingress and frost damage has resulted in severe 'spalling' to the face of the construction materials. Costly reconstruction is now required to the face brickwork due to the failure to address the pointing mortar obsolescence at the correct time. This stage of obsolescence affects factors such as property value, marketability and general perception of maintenance with financial implications for the building owner. 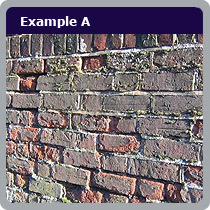 Example B illustrates a section from a 1980’s building with the mortar pointing ‘raked’ back by the bricklayers due to the lack of skills available to provide a quality finish for the pointing of the face brickwork. Unfortunately, this approach has resulted in water ingress and moisture build-up into the building fabric which highlights the requirement for the pointing element of construction. 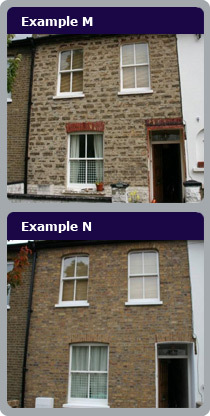 Examples K and L illustrate sections of two elevations immediately after repointing work has been carried out. There are a number of obvious problems associated with the quality of workmanship. Firstly, the composition of the mortar is building sand and ‘Portland’ cement, with the absence of any lime content. Without the use of lime, the new pointing mortar will not key to the existing mortar with the subsequent implications for the life cycle of the work. Secondly, the incorrect mortar has been prepared without any form of measurement, indicated by the array of different colours of the mortar. 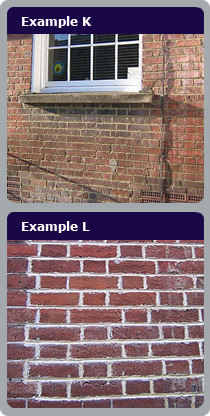 Thirdly, the staining to the face brickwork during the preparation stage indicates that the elevations were not cleaned correctly and subsequently not reactivating the existing dormant lime mortar. This saturation of the existing lime mortar is required to provide the key between the new and existing mortar. Finally, the quality of the pointing is extremely poor with mortar stains to the brick face and uneven finish to the surface of the mortar. 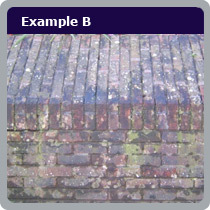 Today, there are many examples of poor workmanship concerning the repointing of buildings in the UK. Fortunately, in most cases, it is possible to recover the original specification after such poor quality workmanship. In example M, the face brickwork to the facade has been seriously damaged with mortar stains due to poor workmanship. This type of poor quality workmanship will significantly affect the aesthetic value of the property. Example N illustrates the same facade after Wiltshire Restoration Ltd was commissioned to recover the face brickwork and return it to its early 19th Century specification.